If you want us to schedule some time for you on one of these events, please mail us. PanAmerican Seed (PAS) is a part of the Ball Horticultural Company. PAS is the world's leading breeder and producer of F1 and open-pollinated flower seed and PAS markets its products to both wholesale and retail distributors around the globe. PAS products are a wide range of flower seeds like Impatiens, Begonia, Dahlia, Petunia, Lavender and many others. All products are of own breeding and produced mostly at own production locations. For our ABS newsletter we interviewed Nico Smit, IT manager of PanAmerican Seed. In 2001 before Kieft Seeds was taken over by PAS, Kieft implemented ABS Seed, then named Agro Business System. Nico was already then involved in the implementation of ABS at Kieft. In 2009 Kieft was incorporated in PanAmerican Seed group. The location in Venhuizen (NL) was maintained along with its activities: breeding, seed technology and production. Kiefts products started to be marketed worldwide through all the PAS distribution companies. With the integration of Kieft in PAS, ABS Seed is still maintained next to the main software SAP. ABS Seed still is the main system to support operations for seed production, inventory management, processing, quality testing and seed tuning in PAS. ABS is mainly used in PAS Holland and since two years ABS is also used at sites in Guadalupe and Costa Rica. 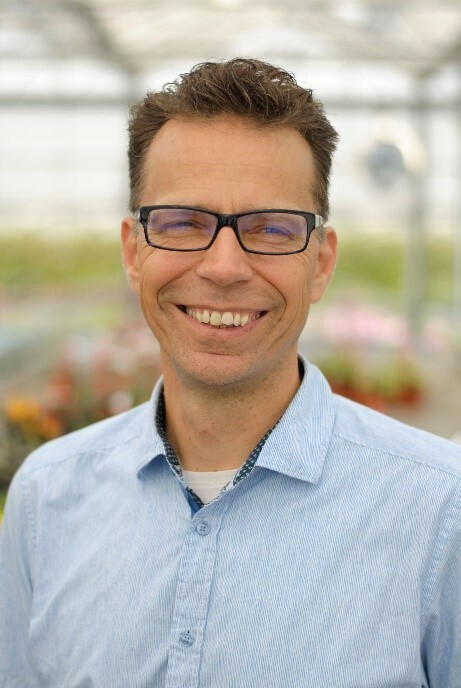 ''The system is designed to do seed administration and you can see that the programmers understand our business", says Nico, "It is easy to use and has lots of possibilities. Now we are hoping for the next step: a Web based ABS." We also asked Nico about his experience with the support of ABS. Nico states: "ABS has a very good functioning helpdesk with a good service level. Problems are mostly solved quickly, sometimes updates could come faster." "We are now working together with ABS on new functionalities to support our Tissue Culture lab. Materials in the chambers are administrated in ABS. The workflow for maintenance and production is done in ABS. 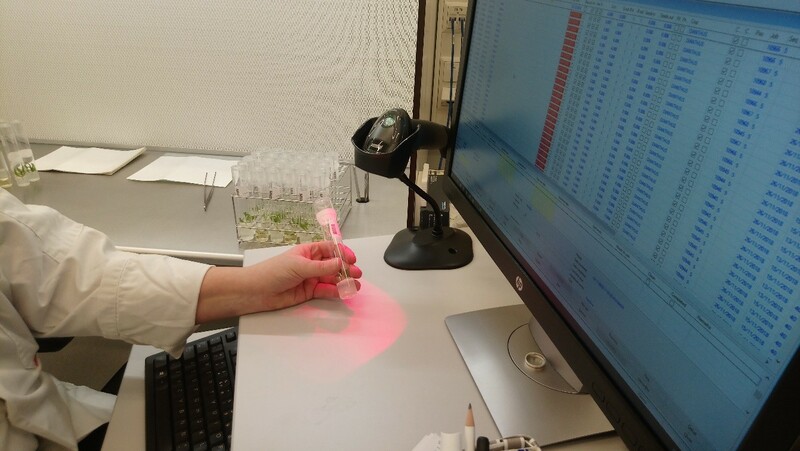 ABS has replaced a series of Excel sheets which were used until recently to monitor the tissue culture processes. Today implementation is ongoing in Venhuizen. After the "go-ahead" decision ABS will be supporting other tissue culture labs in PanAmerican Seeds group. Sometimes there is a need to process data from external sources, such as Mobile Apps, MS Excel sheets or third party software solutions, into the ABS Seed software solution. We had to make sure to use the existing ABS Business Logic while importing data from other solutions. ABS Connects are used for this purpose. These connects (or API's) will make sure that data, which is uploaded, is handled in the same way as the data entered in ABS itself and that the maintenance of the business logic is only done at one location. So ABS Connects can replace manual data entry in ABS Seed. For example using the Forecast Connect you can upload Forecast quantities and prices into the Forecast Display module. When excel templates are used to gather sales forecast data or the sales representative uses a Mobile App to register forecasts, the Forecast Connect can be used to import these data into ABS Seed. Still in the planning we have: Expedition Connect, CRM Connect and Accounts Receivable Connect. Contact ABS for more information on licensing these Connects. In ABS Breeding you can build your own SQL queries now or alternatively we can build them for you. With a SQL query you can build your own information set and overviews. Working in this way with ABS Breeding it is possible to create your own SQL widgets with information which is set to the specific needs of the individual user. For example the SQL queries can be used to create specific overviews on selections, tests, crossings, lay-out etc. In the above example a "SQL widget" is created to show the location of a certain plant in different lay-outs (or fields). The user gets the field location information of this plant (w18-0001-01) immediately available in his screen or screens. 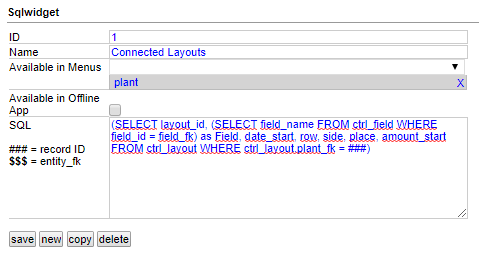 So the widget "connected layouts" shows that the plant w18-0001-01 is located on 9 different fields, with start date, row, side, place and amount start in the field. The data which is shown from the lay-out can also be different. For example the last inspection date can be shown, if you create a different SQL query. Copyright 2018. Agro Business Solutions B.V. All rights reserved.